In Part 1 of this series I took a look at what the World Series of Poker is likely to do for the 10th Anniversary of Chris Moneymaker’s dramatic 2003 WSOP victory, and also what they will/should do to honor Doyle Brunson, who is the last of the original 1970 WSOP competitors to play in the tournament series, but will be skipping this year’s series, essentially retiring from WSOP play. So far the only real-money online poker site that has launched in Nevada has been Ultimate Poker, and the launch of Ultimate Poker has been underwhelming to say the least. However, with thousands of poker players about to descend on Las Vegas for the next six-weeks the numbers could go through the roof, and it could be the perfect time for other sites to launch their own online poker rooms…. Well maybe. With an influx of players we could very well see the potential for US online poker, but we could also see perhaps some of the worst games in the history of poker, as most of the players will likely be reasonably good (they are playing WSOP tournaments after all) which could leave a bad taste in the mouth of the few recreational players Ultimate Poker does have. 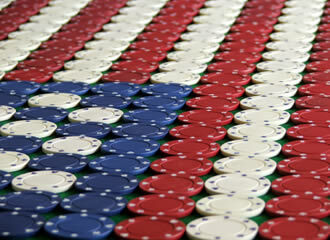 The reality of the situation is that legal poker in Nevada could end up being decimated by the WSOP! With a high population of sharks during the most active season for poker searches and news, casual players who stumble onto Ultimate Poker or whatever other site is launched, may very well find the games unbeatable, and conclude that they are either 1) No fun, or 2) rigged. Essentially, by trying to capitalize on the influx of players from the WSOP, a poker site could very well be killing its long-term prospects to attract casual and recreational players. Another potential pitfall for the sites, and Ultimate Poker has shown a troubling habit of stepping in pitfalls early on, is the influx of players could overwhelm the site’s servers; which have yet to be really tested at this point from a traffic standpoint. In general I wouldn’t be too concerned about this, but with Ultimate Poker using their own software they don’t have the experience of an 888 or other company to fall back on, when it comes to traffic surges.